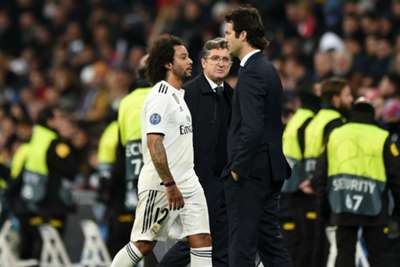 Marcelo does not believe Real Madrid have an attitude problem following their humiliating Champions League defeat to CSKA Moscow. Madrid crashed to the heaviest home defeat in any European competition in the club's illustrious history, the three-time reigning Champions League winners stunned 3-0 at the Santiago Bernabeu. Fedor Chalov, Georgy Schennikov and Arnor Sigurdsson condemned Madrid to a forgettable night in the Spanish capital, though Wednesday's result had no impact on Marcelo and his team-mates finishing top of Group G.
Reflecting on the sixth and final matchday before the last 16, Madrid star Marcelo told reporters: "I don't think it's an attitude problem. "We never take to the pitch with the wrong attitude but perhaps some of our play may have been interpreted like that [against CSKA]. "You always have to play with desire at Real Madrid. There's a long time until the last 16, we must improve and change the image we've given of ourselves. We have to be motivated and flying high at the Bernabeu." Marcelo added: "We always want to win and give a good account of ourselves but sadly we weren't able to do that. We had several chances in the first half, we had so many shots on goal, but they had three and scored three goals and they deserve the win. "We have to keep working hard. Every game is different, you play one way, with one team-mate or another, and these defeats happen in football." It was a tense atmosphere in Madrid, where the team – especially Isco – were jeered and whistled during the second half. Asked about the whistles, Marcelo said: "When the fans whistle, it's clear that you have to change something and the fans have every right to do it. "We're hurt but we're a team and we're going to work so that it doesn't happen again. We're not happy because we can't play like today and put on a show like that. We tried to give it a good go but the match didn't go as we expected. "At Real Madrid you have to fight until the end. It was difficult to come back from 3-0 although we tried until the final whistle."